Fresh of the back of supporting The Whitlams and Boy and Bear, Taylor are bringing their unique style and swagger into 2018 with a new recording set to stun. Little Tornado, the first single off their upcoming EP will be unleashed on Friday 8 June. 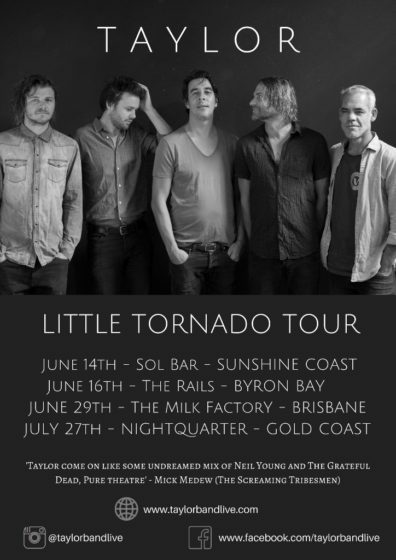 They’re looking forward to an East Coast single tour kicking off on 14 June and running till July 27 with shows at The Rails Byron Bay, Nightquarter Gold Coast, The Milk Factory in Brisbane and Solbar on the Sunshine Coast. Front man David Taylor’s memorably moody vocal timbre is framed by the virtuoso musicians he’s assembled, including Nick Stewart from ARIA award winning band George, conservatorium trained Crick Boue, Michael McCartney (Ash Grunwald, Jimmy the Saint and the Sinners) and multi-instrumentalist Scott French. Taylor has honed a style and sound sophisticated in its harmony and uniquely theatrical in its performance. Their live show is mesmerising, dynamic and thoroughly unforgettable.